Stumped by mysterious illnesses in at least 600 dogs in the U.S., federal health officials have turned to consumers for help investigating problems possibly tied to chicken jerky pet treats made in China. 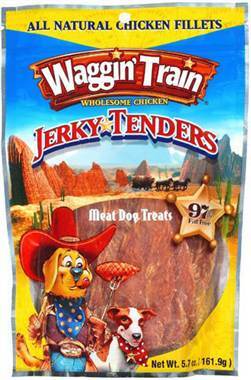 Of 22 “Priority 1” cases listed by the FDA late last year, 13 cited Waggin’ Train or Canyon Creek Ranch jerky treats or tenders, both produced by Nestle Purina PetCare Co., the records show. Advertise | AdChoicesAnother three listed Milo’s Kitchen Home-style Dog Treats, produced by the Del Monte Corp. The rest listed single brands or no brand. Priority 1 cases are those in which the animal is aged 11 or younger and medical records that document illness are available, an FDA spokeswoman said. In many cases, samples of the suspect treats also are collected. The report, obtained through a public records request, is the first agency indication of any brands linked to illnesses that have climbed since the FDA warned pet owners about jerky treats in November. That was the FDA’s third caution about the pet products since 2007. Nestle Purina and Del Monte officials said their treats are safe and FDA regulators said repeated tests have shown no absolute tie to any brand or manufacturer. The internal report, overseen by the FDA’s Coordinated Outbreak and Response Evaluation, or CORE, group, is one of several ongoing assignments in which FDA regulators are seeking jerky treat samples and medical records of dogs that may have developed kidney failure, liver disease or Fanconi syndrome, which can lead to serious illness and death. The recent complaints were filed from October through December by people in cities from California to New York, but the agency will continue to accept them. The move comes as the FDA is under growing pressure from consumers and lawmakers to address rising numbers of illnesses blamed on the China-made treats. Before the warning was issued in November, the agency had logged 70 reports of illnesses tied to the treats last year. Since then, more than 530 additional complaints of illnesses and some deaths have been filed, officials said. Bella, a 2-year-old pug, died last fall after her owner, Robin Pierre, said she ate Waggin’ Train chicken jerky treats. Consumers who say their dogs were sickened or killed have launched at least three petitions demanding recalls of jerky pet treats made in China, including one begun in December that has more than 3,400 signatures from the U.S. and around the world. Pierre, 49, of Pine Bush, N.Y., believes Waggin’ Train chicken jerky treats were responsible for the sudden death last fall of her previously health 2-year-old pug, Bella, who developed kidney failure. More than 375 people have signed a petition launched last week by Susan Rhodes, 51, of Port St. Lucie, Fla. She believes her 14-year-old dog, Ginger, may have developed life-threatening kidney failure after eating chicken jerky treats. She was stunned to hear that consumer complaints alone can’t force the FDA — or a company — to recall potentially tainted products. Lawmakers, however, are demanding stronger FDA action. Ohio Democrats Sen. Sherrod Brown and Rep. Dennis Kucinich in February called on the FDA to step up investigation of tainted pet treats. In a response sent late last week, an FDA official told Brown the agency “continues to actively investigate” the reports and to pursue testing for chemical and microbiological contaminants. On Monday, Brown called the agency’s response “inadequate” and urged prompt release of results of 153 pending tests on the Chinese-made treats. “I will continue to press the FDA on this issue because Ohio consumers shouldn’t have to worry about the safety of their pet’s food,” he said in a statement. So far, they’ve found nothing convincing, a point emphasized by Keith Schopp, director of communications for Nestle Purina. He noted that FDA officials also suggest that illnesses may be a result of causes other than eating jerky treats. Pierre, who lost her dog, has little faith in pet food manufacturers — or in the FDA. This entry was posted in chicken jerky, illness on March 14, 2012 by yourfriends.